The times have certainly changed over the course of recent years and with the ever growing love for technology, situations are now coming to light and can be considered a threat to younger people, including students in high school and middle school. 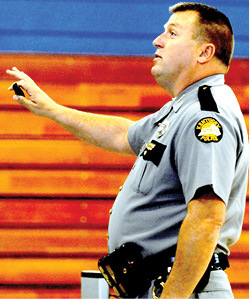 Kentucky State Police Trooper Jonathan Biven, Director at Trooper Island, has recently spear headed a program designed to inform people about the dangers of social media and other programs that are readily available on phones and tablets across the country. 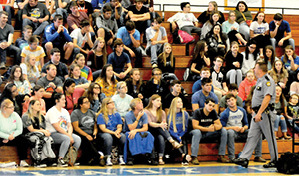 Last Thursday, Biven was a guest speaker at Clinton County High School where he provided four presentations, once to each of the four grade classes, about social media. Biven said Thursday’s presentation was more of an educational presentation to let the students know they can be held accountable. One of the main reasons for doing the program is to inform parents of the social media dangers of what their kids might be doing with their phone or tablet. One of the biggest concerns is Biven feels parents don’t believe it’s a problem right now. In 2017, information was gathered on some of the more popular apps across the country and some of the numbers are extremely high as far as the number of users every sixty seconds. 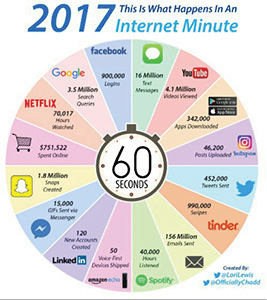 Facebook alone has 900,000 logins per minute, 342,000 apps downloaded from the Google Play app store every minute, 46,200 photos uploaded to Instagram every minute and 452,000 Tweets sent every sixty seconds. Other apps include Snap Chat with 1.8 million snaps created every minute, and 156 million emails sent. Biven said he would like to host another presentation on social media in January. Details on that presentation are still being discussed and is yet to be scheduled.